Brilliant fuchsia and dusky olive green dominate this color palette, echoing the vivid blooms and verdant foliage of a tropical paradise. Think “tropical paradise” and visions of vividly-colored flowers and verdant foliage come to mind. These are precisely the inspiration for an elegant luau color palette, with fuchsia and olive green as the dominant colors. Brilliant fuchsia sets the scene through the tablecloth that underlies all the other table elements, while olive green serves as a complement with fresh hues of leaves and rich tones of olive fabric. Each balances the other, while at the same time enhancing one another’s lovely shade. In addition, earthy colors such as brown, sand, and the natural tones of bamboo and shells provide the neutralizing elements in this palette; while splashes of flaming orange from bromeliad blooms act as the accent color. Lastly, add touches of yellow to complete the tropical color scheme. Handcrafted seashell card holders display the guests’ place cards, while also bringing an organic feel to the table display. To extend that authentic tropical feel to the individual place settings, use square wooden plates with fabulous wood grain in place of traditional porcelain dinnerware. Then to complete the look, arrange slender sticks of bamboo in criss-cross fashion amidst the table display elements, with the longer pieces serving as unique table runner down the center of the table. 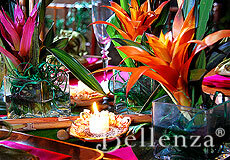 Tea lights on elegant shell trays cast a warm glow over the foliage of a luau table setting. For luau-style illumination at the venue, there are a number of alternatives to the customary tiki torches. For instance, consider lining the pathway from the wedding venue to the party with candles housed inside smoked-glass lanterns. 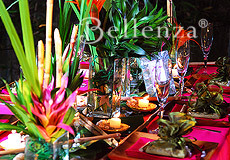 Then, softly light the luau venue itself using fabric-covered glass luminaries featuring tropical-inspired patterns such as hibiscus or shells. For the tabletops, a softening feature is called for. 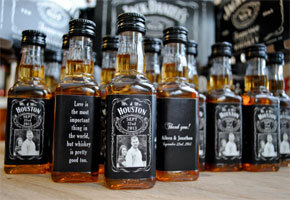 The perfect romantic touch? Warmly glowing tea lights set at random among the decor pieces. As lovely tea light holders, these seashell candle trays enhance the decor of the party’s theme, with a handful of sand and tiny loose shells providing a bed for each candle. 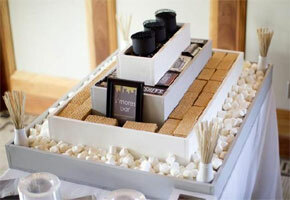 Incidentally, a practical option would be to use citronella-infused tea lights to ward off any mosquitoes and other insects, while larger citronella candles may be set underneath the tables and around the venue. Present pretty luau mementos with shell frames wrapped in shimmering olive organza. 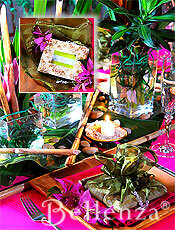 Luau-inspired favors ensure that guests go home with warm memories of the wedding luau. Lovely shell-encrusted picture frames, for example, would be much appreciated as both a decorative and a practical gift. To present them at the wedding, display these frames as part of the table decor, each packaged in an olive-colored organza wrap and laid atop the place setting with a sprig of fuchsia bougainvillea, which completes its authentic luau look. An elegant luau-inspired wedding party is indeed right within a couple’s reach. The key is to select stylish decorative elements that capture the look of a tropical island paradise—magically recreated on each tabletop. It begins with a color palette using fuchsia and olive green as the principal hues, and orange as the accent color. Earthy tones and organic textures are introduced through wood, bamboo, and shell elements; while glimmering tea lights are positioned amidst the table display. 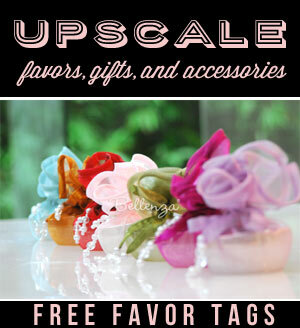 And lastly, tropical-inspired gift items go from tabletop decor pieces to take-home guest favors. Want More Luau Ideas? Follow our Board! Hi guys! I was wondering where can I find wooden plates like the ones you used here? I love this theme design. It’s just teeming with vibrant colors! What are some ideas for planning a luau menu? I’d check out recipes from Roy’s Hawaiian fusion book! There are some nice ideas there. I think you may able to find wooden plates at stores like Pier One or CostWorld Imports. Good luck! Greetings Jen! Those were assembled in glass vases that were filled with water! 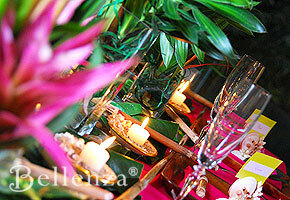 Then simple raffia ribbons were wrapped around the bromeliads to keep them together. Great presentation, did you use chair coverings? And if so, what color? I am using this idea for my daughter’s first birthday luau. I am on a budget. As for the centerpieces; may you email me as to what the flowers are called? Also, what are the leaves on there called?? Hello, Valentine! The flowers in the vases are called bromeliads, and should be available at garden stores or plant nurseries selling tropical plants. 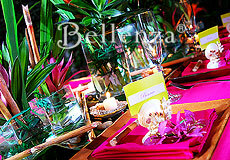 The fuchsia flowers scattered on the place settings are bougainvilleas — another tropical bloom. But if fresh is too expensive, you could get a similar effect with fabric orchids found at a home decor or craft supply store. Happy birthday to your daughter! Hi, I am planning a Luau Rehearsal Dinner. I love the elegant table idea you have. I was wondering where I could get those wooden plates that are pictured in you photo? Thanks!